Your Financial Assistance is Crucial! Sunshine Coach is a fare based service that provides transportation using specially equipped accessible vehicles operated by a staff of professional drivers. Fares alone fall well short of covering the costs of providing the service and consequently the need for subsidies is great and growing! To charge levels of fares that would fully cover costs would place the service beyond the reach of most of our clientele, many of whom are among the most economically vulnerable members of our community, living on fixed incomes. General Donations which will be applied directly to assist in defraying operating costs on behalf of all of our clients are welcome at any time during the year. Any donations of $10.00 or more will be issued a charitable donation tax receipt by Friends of the Disabled (Renfrew) Inc. upon receipt of your payment. Memorial Donations may be made using secure online donation via Canada Helps, by sending your cheque or money order by mail to 44 Railway Avenue, Renfrew, Ontario K7V 3B1 or by visting the Sunshine Coach Offices during regular business hours. 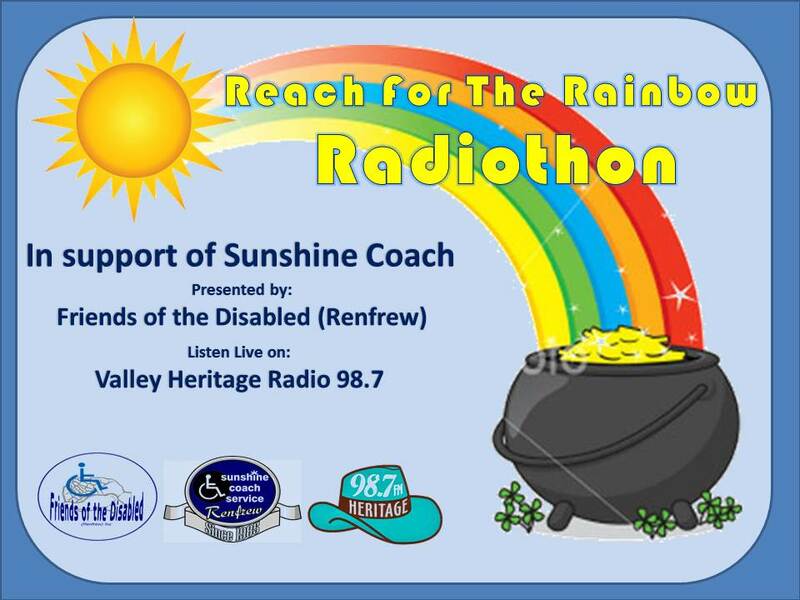 Please make cheques payable to Friends of the Disabled (Renfrew) Inc. or to Sunshine Coach Service. Many of our clients are not only living with disabilities but many are also living on fixed incomes. In many cases, Sunshine Coach is not only a service but to many it is an essential service, providing access to things that many of us take for granted. For example, a donation of $60.00 will provide the equivalent of ten (10) in-town trips. Our Operations Department will disperse Adopt A Rider donations among our clients who are most in need. Sunshine Coach (under the auspices of our charitable organization Friends of the Disabled (Renfrew) Inc.) accepts donations online through CanadaHelps.org, a charitable organization registered with Canada Revenue Agency which provides secure processing for major credit cards and provides immediate charitable receipts directly to you via e-mail. You may click this link to be directed to the Canada Helps web site where you will find much more information related to the services they provide. 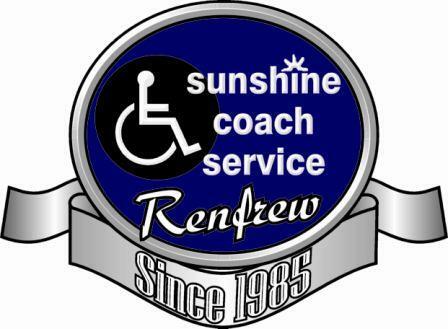 If you should like to make a donation to Sunshine Coach while viisiting their site, please search for our charity under Friends of the Disabled (Renfrew) Inc.
You may click the links below to make donations directly to the various Sunshine Coach funding initiatives.